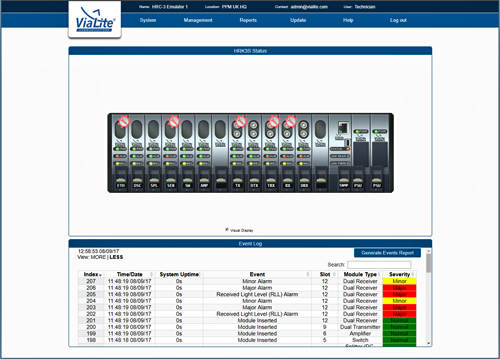 ViaLite has launched its new, faster SNMP module and software at IBC in Amsterdam. The SNMP allows for network management of ViaLite RF over fiber systems. The new software is more intuitive, easier to use, has a modern look and feel, and is no longer reliant on Java. The software has also been designed for use with existing ViaLiteHD SNMP modules, as a standalone program. The new module has many new features, one being that users can set their own alarm priorities so they can decide what is reported within their network management system. Users can also choose which alarms trigger 1:1 redundancy switching and a maintenance mode has been added enabling users to disguise a module that is being worked on so alarms are not triggered.